Determining the "Best Cape Cod Beaches", really depends on what activities you enjoy. The above photo is from Cahoon Hollow Beach on the Cape Cod National Seashore. This area is surprisingly diverse in its terrain. The outer Cape's beaches are best characterized as wild, ungroomed and sometimes dangerous. They frequently have strong crashing waves and are ideal for surfing. Enough can't be said about the strong currents and undertows that are always a possibility on the outer Cape Cod beaches. Because of this, please visit my important page about rip currents. 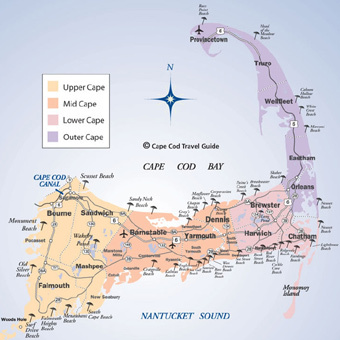 Most of the outer Cape Cod beaches form the Cape Cod National Seashore which is a protected national park. The National Seashore is steeped in history and defines what is Cape Cod. Learn more about the history of the Cape Cod National Seashore. The inner Cape Cod beaches along Cape Cod Bay, are long, flat, expansive stretches of sand. These are better suited for young children or inexperienced swimmers. Please be careful of walking through dunes while on all Cape Cod beaches. The dunes are nurseries to many creatures like the endangered Piping Plover. In addition, these areas and animals are federally protected. Click on map to expand. East Sandwich Beach: Ploughed Neck Road off Route 6A. Sandwich Town Beach: On Town Neck Road -- This beautiful Cape Cod beach has a boardwalk over the marsh to the beach. Nice for bird watching. Sandy Neck Beach: This is a bayside Cape Cod beach that extends into Barnstable. Has 4 wheel vehicle access. Mashpee-Wakeby Pond Beach: Fresh water pond off of Sandwich-Cotuit Road. Sandwich beach stickers can be purchased at the Tax Collector's Office located at Town Hall Annex, 145 Main Street. 4 wheel drive permits are available at the Gatehouse at Sandy Neck Beach, 508-362-8300 or at the Barnstable Department of Natural Resources 508-790-6272. Barlows Landing: Off of Route 28 in Pocasset. Electric Avenue: Off Electric Avenue in Buzzards Bay. Monument Beach: Overlooks the Cape Cod Canal, located off Route 28 in Bourne. Monument has a snack bar and bathroom facilities. This Cape Cod beach is also a popular wind surfing and watersports location. Queen Sewell Pond: Off Puritan Road in Buzzards Bay. Sagamore Beach: Off of Scusset Beach Road in Sagamore. Scusset Neck: Off of Scusset Beach Road in Bourne. When you arrive on the Cape, this is the first major Cape Cod beach you will come across. There are a lot of pebbles on the beach unlike the CCNS beaches but is very pretty and worth the visit. There are washrooms, showers and a picnic area. A great spot for picnics and frisbee. Squeteague Harbor: Ocean side beach off of Scraggy Neck and Squeteague Roads in Cataumet. Beach stickers can be purchased Monday through Friday 8:30am - 4:30pm at the Natural Resources Office at Bourne Town Hall at 24 Perry Ave in Buzzards Bay. For more information on Bourne beach stickers, call 508-759-0621-- ext# 3. Falmouth's seven villages include North Falmouth, West Falmouth, Woods Hole, Falmouth, Teaticket, East Falmouth, and Waquoit. Chapoquoit Beach: Bayside beach off Chapoquoit Road in West Falmouth. Also known as Hog Island. This Cape Cod beach has washrooms and a food truck in the summer. Old Silver Beach: Bayside beach off Quaker Road in North Falmouth. This Cape Cod beach is a popular family destination, and the waters are typically quite warm in the summer. There are washrooms, concessions and a bathhouse. Wood Neck Beach: Bayside beach off Palmer Avenue and Sippewissett Road. Falmouth Heights Beach: Sound beach, take Falmouth Heights Road to Grand Avenue. Menauhant Beach: Sound beach off Menauhant Road in East Falmouth. Surf Drive Beach: Sound beach located on Surf Drive, this Cape Cod beach is a popular destination for families. There are public washrooms, concessions, and showers. You can purchase beach stickers at Ellen T. Mitchell Bath House on Surf Drive starting Memorial Day weekend. For questions on Falmouth beach stickers, call 508-548-7611. South Cape Beach: Located on Great Oak Road; great fishing and a concession stand, parking and washrooms. Attaquin Park (Mashpee/Wakeby Lake): Freshwater lake located in Mashpee off Route 130. Johns Pond: Freshwater pond located off Route 151 and Currier Road. You can purchase beach stickers at Town Hall, located at 16 Great Neck Road North. The sticker office is open Monday through Friday, 9am - 4pm. For information on Mashpee beach stickers, call 508-539-1400. Barnstable includes Centerville, Osterville, Hyannis, Marstons Mills, Cotuit, and West Barnstable villages. Craigville Beach: located off Craigville Beach Road on Nantucket Sound. This Cape Cod beach is one of the most popular and has restrooms, concessions, and showers. This is where everyone goes to be seen and socialize. Hathaway's Pond: small freshwater pond located off Phinney's Lane in Hyannis. Kalmus Park Beach: located on the Lewis Bay at the end of Ocean Street in Hyannis, and has restrooms and concessions. One of the best Cape Cod windsurfing locations. Sandy Neck Beach: located on the Cape's Bay side in West Barnstable, this is the Upper Cape's longest beach. Large dunes and a six-mile sand spit makes it a great place for four wheeling. Sandy Neck offers showers and a snack bar. Sea Street Beach: at the end of Sea Street in Hyannis. Veterans Park Beach: behind the Kennedy Memorial on Ocean Street, Hyannis. Covell Beach: on Cragville Beach Road in Centerville. Dowses Beach: on East Bay Road in Osterville. East Beach: on Iyanough Avenue in Hyannisport. Hamblins Pond: Route 149 in Marstons Mills. Joshua's Pond: Tower Hill Road in Osterville. Loop Beach: on Ocean View Avenue in Cotuit, this beach has restrooms and a bathhouse. Lovell's Pond: on Newtown Road in Marstons Mills. Millway Beach: on Millway in Barnstable. Wequaquet Lake: off of Shoot Flying Hill Road in Centerville. Beach Stickers can be purchased at the Recreation Department at the Kennedy Arena. The sticker office is open starting in May, Monday through Friday from 9am - 4pm. 508-790-6345. Bass Hole Beach (Gray's Beach): Overlooking Bass Hole in Yarmouthport; at the end of Center Street; limited free parking. Bass River Beach (Smuggler's Beach): At the end of South Shore Drive, off Old Main; fee required. Bay View Beach: Overlooking Nantucket Sound; almost at the Barnstable town line; free parking. Colonial Acres Beach: On Bay View Street off of Lewis Bay Road; free parking. Englewood Beach: Located on Berry Avenue; free parking. Parkers River Beach: Off of South Shore Drive; fee required. Sea Gull Beach: Off of Sea View Avenue; the largest Yarmouth Beach; fee required. Sea View Beach: Off Route 28 in West Yarmouth; on South Shore Drive. Windmill Beach: On River Street near the Bass River; free parking. South Middle Beach: Off of South Shore Drive; residents only. Bayview Beach: Off Route 6A, on the bay side. Chapin Memorial Beach: Off Route 6A in Dennis Village, on the bay side; on Dr. Bottero Road. This is a popular 4 wheeling beach and a good spot for digging up clams when the tide goes out. Cold Storage Beach: A bayside beach in East Dennis off School Street and Cold Storage Road. Corporation Beach: Off Route 6A on Corporation Road, on the bay side. This beach is a popular with families and has restrooms, concessions and even a playground. Depot Street Beach: Depot Street off Lower County Road. Glendon Road Beach: Off Route 28, on the Atlantic side; Old Wharf Road off Lower County Road. Harborview Beach: Off Route 6A, on the bay side; residents only. Haigis Beach: In Dennis Port off of Lower County Road, Off Route 28, on the Atlantic Ocean side. Horsefoot Path Beach: Off Route 6A, on the bay side. Howes Beach: Off Route 6A, on the bay side. Inman Road Beach: Off Route 28, on the Atlantic side; Lower County Road to Inman Road in Dennisport. Mayflower Beach: Off Route 6A, on the bay side. This beach is a popular family destination, with restrooms and snacks. Sea Street Beach: Off Route 28, on the Atlantic side; in Dennisport. South Village Road Beach: In Dennis Port off of Route 28, on the Atlantic side. West Dennis Beach: In Dennis Port off of Davis Beach Road, this is a mile-long beach with a bathhouse, restrooms, boardwalk, and lots of parking. Dennis beach stickers can be purchased at Dennis Town Hall located at 485 Main Street in South Dennis. The sticker office opens Memorial Day weekend, and is open Monday - Saturday 9am - 4pm and Sunday 9am - 12pm. 508-760-6159. Bank Street Beach: Located on Nantucket Sound near Harwichport center; at the end of Bank Street. This Cape Cod beach is very crowded in the summer season. It's warmer waters are great for swimming. Bucks Pond Beach: Fresh water beach off of Route 39. Fernandes Bog: Off of Long Pond Drive, between Routes 137 and 124. Long Pond: A large freshwater pond located off of Routes 124 and 137. Pleasant Bay: Off of 28 on Pleasant Road in West Harwich; limited parking spots. Red River Beach: One of Harwich's larger beaches, off Route 28. This beach is also a great location for swimming, and has washrooms. Sand Pond: Near town center, on Great Western Road. Beach stickers are available at the Harwich Community Center located at 100 Oak Street. The Community Center is open 7 days a week, from 8am - 3pm. 508-430-7555. Breakwater Beach: A bayside beach off Breakwater Road, off 6A; near the Brewster General Store. This beach is a popular destination for families. Crosby Landing Beach (Crosby Beach): A bayside beach on Crosby Landing Road, off 6A; about 1.5 miles before the Orleans town line on Route 6A. Ellis Landing Beach: A bayside beach on Ellis Landing Road, off 6A; about 2 miles before the Orleans town line on Route 6A. Linnell Landing Beach: A bayside beach on Linnell Landing Road, off 6A; about 1.75 miles before the Orleans town line. Paine's Creek Beach: A bayside beach on Paine's Creek Road; 1.5 miles west past the intersection of Route 137 and 6A. Point of Rocks Beach: A bayside beach off Point of Rocks Road, off Route 6A; 1 mile east of the intersection of 6A and Route 124. Robbins Hill Beach: A bayside beach 1 mile off Lower Road, which intersects with Route 6A. Nickerson State Park: Nickerson Park off of 6A in Brewster offers beautiful fresh water ponds for swimming and canoeing. Saint's Landing: A bayside beach 1 mile off Lower Road, which intersects with Route 6A. Long Pond: Off of Mammon Drive in Brewster. Upper Mill Pond: Off of Run Hill Road in Brewster. Beach stickers are sold Monday through Friday from 9am - 3pm at the Brewster Visitor Center at the Brewster Town Hall Offices, 2198 Main Street (Route 6A). The sticker office is open from June through August. 508-896-4511. Brewster's Beaches are located along the inside of the Cape on Cape Cod Bay so the waters are generally warmer and tranquil. Cockle Cove Beach: This Cape Cod beach is on the waters of Nantucket Sound, off Route 28 at the end of Cockle Cove Road. Very popular with families. Really nice soft sand and washrooms make it a great place. Forest Beach: At the end of Forest Street, south of Route 28. Goose Pond: Kettlehole pond off of Queen Anne Road. Hardings Beach: Off Harding's Beach Road; off of Route 28 and Barn Hill Road. Has washrooms and a snack bar. Lighthouse Beach: This Cape Cod Beach is an ocean side beach off of Shore Road. North Beach: Ocean beach, only accessible via 4 wheel drive vehicles or boat. No amenities of any kind. Oyster Pond: Small saltwater pond, perfect for children; off of Stage Harbor Road. Must have a beach sticker. Pleasant Bay: Off of Route 28. Ridgevale Beach: A public beach on Nantucket Sound, off Ridgevale Road; off Route 28. School House Pond: Freshwater pond, off of Queen Anne Road. Also need to have a sticker. White Pond: Freshwater pond, off of Queen Anne Road. Non residents may purchase beach stickers at the beaches. Residents only may purchase stickers at the permit office. 283 George Ryder Road. 508-945-5180. Parking at School House Pond is only available for people with resident stickers. Skaket Beach: A bayside beach off of Skaket Beach Road. Great place to view a sunset. Pilgrim Lake: Fresh water beach on Monument Road off of Main Street. Rock Harbor: Ok, technically not a beach but when the tide is out you can walk for miles! More on one of my favourite spots on Cape cod on the activities page. Nauset Beach: Not to be confused with Nauset Light This beach is one of the largest, most popular and most beautiful beaches on the Cape. Nestled along a stretch of sand dunes, this wide sandy beach is popular with teens, young adults, families, tourists, and locals alike. Swimming and surfing are hugely popular and the water is COLD. Surfcasting for striped bass and bluefish are also enjoyed here. Take Main Street through east Orleans to Ocean Street. Follow Ocean Street to end. There are washrooms and outdoor showers. Lifeguards patrol the beach from guard towers and four wheel drive vehicles. The snack bar offers hamburgers, hot dogs, fried seafood, ice cream, drinks, etc. Upon passing through the toll booth at the entrance of the beach you will find a large parking lot that fits several hundred vehicles. Numerous paths through the dunes, several of which are wooden and wheelchair accessible, make an easy walk to the beach from the lot. Parking fees are $10 per day during the summer season. The parking lot often sells out on weekends and holiday weeks during the summer, so plan to arrive early to ensure your spot. Orleans beach stickers for residents and taxpayers can be purchased at the former American Legion building, Thursday through Monday 9am - 4pm. Visitor beach stickers for Orleans are sold at Nauset Beach, on weekends from 9am - 4pm and 7 days a week after June 14th. 508-240-3780. Campground Beach: A bayside beach located off Shurtleff Road. Cole Road Beach: A bayside beach located off Cole Road, off Herringbrook Road. Cooks Brook Beach: A bayside beach in North Eastham; off Cooks Brook Road, off Massasoit Road. First Encounter Beach: This Cape Cod beach is located at the end of Samoset Road, off Route 6. Great for romantic sunsets. Kingsbury Beach: A bayside beach located off Kingsbury Beach Road, off Route 6. Sunken Meadow Beach: A bayside beach located off Massasoit Road, off Route 6. Thumpertown Beach: A bayside beach off Thumpertown Road, off Herringbrook Road. Great Pond: Fresh water pond off of Great Pond Road. Herring Pond: Fresh water pond off of Crosby Village Road. Wiley Park: Fresh water pond off of Herringbrook Road. Eastham beach stickers can be purchased at the Recreation and Beach Department situated at 2500 State Highway in Eastham. 508-240-5976. Mayo Beach: A bayside beach on Commercial Street off of Route 6. Powers Landing: A bayside beach off of Chequesset Neck Road. Duck Harbor Beach: A bayside beach off of Duck Harbor Road, off of Chequesset Neck Road. Indian Neck Beach: A bayside beach off of Pilgrim Spring Road. Great Pond: Off of Cahoon Hollow Road off Route 6. We always stop here after visiting Cahoon Hollow beach, for a refreshing dip in this warn, clear pond. Gull Pond: Off of Gull Pond Road off Route 6. Long Pond: Off of Long Pond Road off Route 6. Cahoon Hollow Beach: Another great Cape Cod beach is Cahoon Hollow in Wellfleet. Teens and college students hang out here in the summer, mainly because of The Beachcomber restaurant and bar, located right on top of the 90 foot dunes overlooking the beach. They serve lunch, dinner and drinks. A great place to chill after a long at the beach with a beer and oysters. Their burgers are amazing. There are lifeguards in-season and portable toilets. $15 Daily Parking Fee In-Season. From Route 6 in Wellfleet take Cahoon Hollow Road all the way to its end. Lecounts Hollow Beach: also known as Maguire's Landing, is a surf mecca. This Cape Cod beach has cold water, big waves and a steep dune which will give your legs a workout. Lifeguards are on duty in-season and there are public restrooms.Follow route 6 to Lecounts Hollow Rd. Newcomb Hollow Beach: Another great surf spot. A concession truck visits regularly and there are washrooms and lifeguards in-season. Follow Rt.6 to Cahoon Hollow Rd. to Ocean View Dr.
White Crest Beach: Also known as Surfer's Beach and Four Mile Beach, this Cape Cod beach is very popular with surfers. Restrooms, concessions and lifeguards in-season. From Route 6 in Wellfleet take Cahoon Hollow Rd. At its end, turn right on Ocean View Drive and look for White Crest's parking lots on both sides of the road. Get your beach stickers at Wellfleet Town Hall at 300 Main Street in Wellfleet starting June 17th from 8:30am -4:00pm. 508-349-9818. For a truly spectacular view, my favourite road runs between White Crest Beach and Cahoon Hollow. The road is Ocean Drive and it runs parallel to the Atlantic. There are really nice houses which have killer views of the ocean. White Crest also is the Cape Cod beach with perhaps the best photographic, soaring views. Pilgrim Beach: A narrow bayside beach off of Route 6A. Pond Village Beach: A bayside beach off of Route 6A. Corn Hill Beach: A bayside beach on Corn Hill Road; great view of Provincetown; fee required. Fisher Road Beach: Off Route 6 and Old County Road on the bayside. Great Hollow Beach: A bayside beach off Route 6 on Great Hollow Road. This is a nice, quiet Cape Cod beach. Ryder Beach: A bayside beach off Route 6; off Prince Valley and Ryder Beach Roads. Truro beach sticker information can be found at the Truro Town Hall 508-349-7004. Harbor Beach: This Cape Cod beach runs parallel to Commercial Street, along the bayside. You need to pay to park at MacMillan Wharf. Long Point Beach: At the very tip of the Cape where Long Point Lighthouse signals; access by water shuttle or walk from end of Commercial Street. Hatches Harbor: Off of Herring Cove, access by walking or beach vehicle. Provincetown has no town beaches, so you don't need to buy any beach stickers. The two main beaches, Herring Cove and Race Point, are part of the Cape Cod National Seashore. These Cape Cod beaches have a sharp drop-off so be careful with children. See more in-depth information on the CCNS beaches page. Sign up for the Cape Cod Insider today. It's a free monthly E-Zine that I send out to keep you informed of anything new and of interest on Cape Cod. As a special bonus and to show my thanks, I will give you 3 FREE PDF Guides on bicycling, beaches, and nature trails on Cape Cod. I promise to use it only to send you The Cape Cod Insider. "May your wave always be the biggest in the set."